There is a time in late February when a little switch in my head clicks over and I am no longer content with the cabbage slaws that have gotten me though the winter. I want greens: vibrant, lively greens, on my plate and they better be fresh. Nothing in the local grocery can satisfy my craving. Occasionally, I try the hermetically sealed packs of salad greens and spinach from California. Green, yes. Lifeless, also yes. Last week, the spinach that overwintered in our raised bed under cover finally was of a size that we could pick it. Also, five of last year’s red oak leaf lettuces were shooting new growth. I gingerly picked the largest leaves from both, thinning where I could. I brought the pickings into the house like the Holy Grail. A quick rinse and we had a proper salad featuring our own hard cooked eggs. It was heavenly. There is nothing that can compare with freshly picked salad greens given a quick rinse and tossed with your favourite dressing. At some point though, I do look for another way to prepare spinach. One of my favourite ways is to lightly blanch it and toss with a sesame and soy sauce dressing. This is also a favourite of my daughter who has become my dressing chef. See the recipe here. 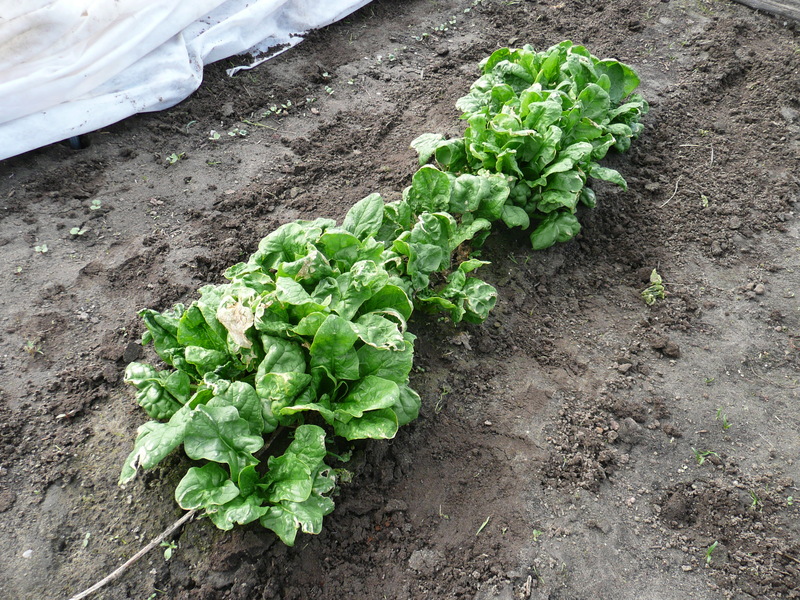 The spinach that survives the winter is ready to bolt as soon as the weather warms up, which could be any day now. 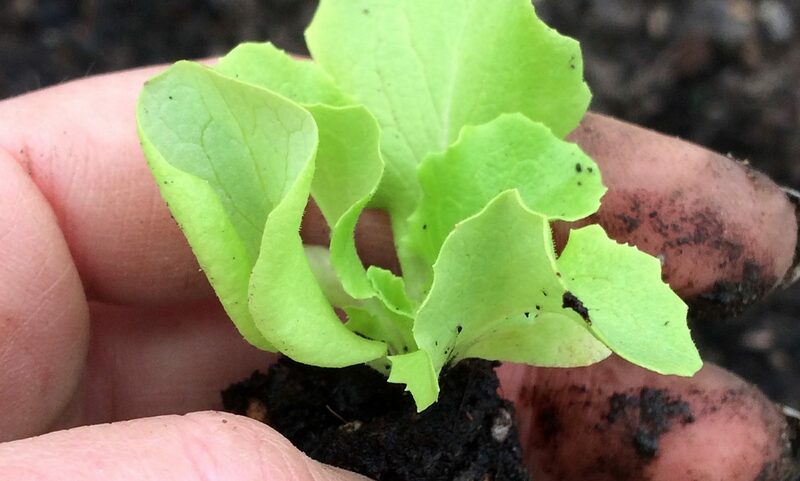 It will be several weeks until the new spinach seedlings are of a size that we can start picking. We will enjoy this abundance while we have it. 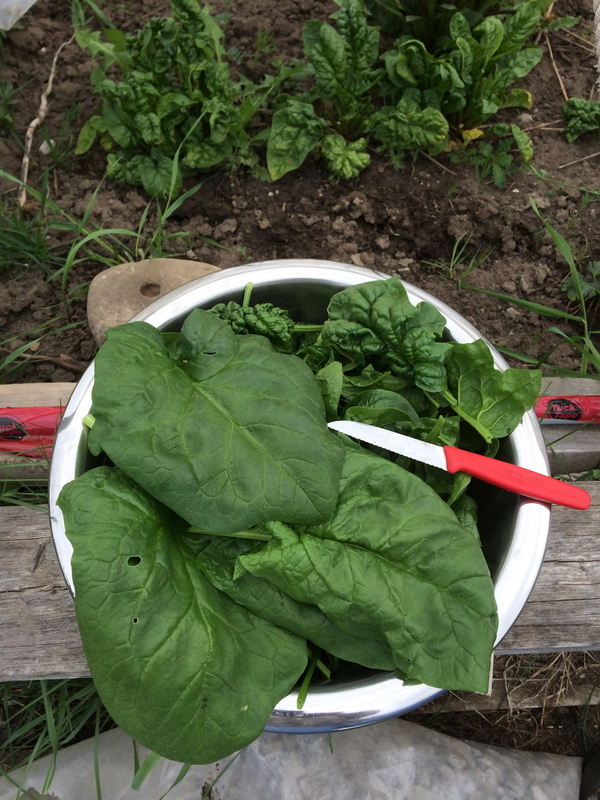 A tasty picking of spinach from the garden over the weekend. Look at the size of those leaves!